We know focus to modern cosmology to illustrate how recurrent puzzles point at the nature of reality. We live in a very peculiar epoch for the understanding of the structure and history of the cosmos. In the last decades, there have been spectacular breakthroughs mainly due to the extraordinary development of observing techniques. The astronomers now have large telescopes with high collecting and resolving power. The quantum efficiency of many classes of detectors is now close to unity, meaning that they actually register all photons that come to them and reach unprecedented levels of sensitivity. The development of ground-based radio astronomy and of satellite observatories in the gamma-ray, X-ray, ultraviolet and infrared spectral ranges has opened the way to a panchromatic view on the universe, and the discovery of many phenomena that are invisible at optical wavelengths. Data processing uses powerful computers and high storage capabilities. As a consequence, we have acquired a treasury of images we are the first generation to contemplate : the image of the earth in the darkness of the sky, the wide diversity of appearance of the surface of other planets and satellites in the Solar System, the mapping of our Galaxy at all wavelengths, the discovery of very energetic phenomena such as star explosions, or the potential census of billions of distant galaxies in deep surveys. We now have access to distances, epochs and structure sizes that were simply unthinkable at the epoch of the Middle Ages when the Arab astronomer al-Farghani computed the distance to God’s throne from the assumptions of Ptolemaic cosmology, and found a value of 120 million km. These new images have deeply changed our awareness of the cosmos. The second point is that, to understand the structure of the universe, we must track its history. This history is theoretically reconstructed from the data by means of elaborated mathematics. No doubt there is a good deal of bold speculations and crazy ideas in the interpretation. But reality resists, and not all theories are in agreement with the facts. On the contrary, the standard theory now appears as a powerful tool to guide new discoveries. To cut a long story short, cosmologists now think that the universe is expanding, and that the expansion phase started from a dense, hot stage called the Big Bang. During the expansion, the matter/radiation content of the universe dilutes and cools, and the relative abundances of various species of elementary particles change. About 100 sec after the Big Bang, light nuclei begin to form. About 1 million year after that, the universe becomes neutral and transparent, and the light emitted by the so–called last-scattering surface at that epoch is observed as the 2.725 K black body radiation of the Cosmic Microwave Background. 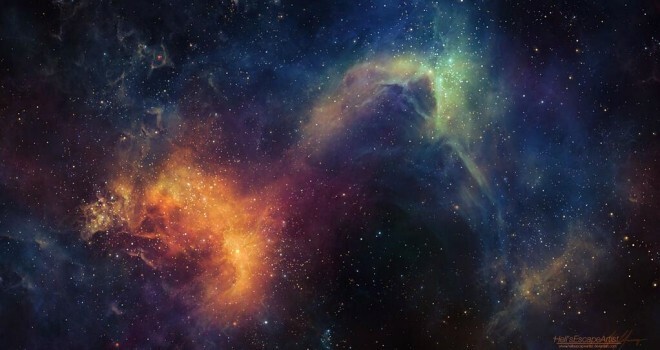 Cosmologists also think that there is more matter in the universe than luminous matter. Dark matter, that is probably not similar to the baryons and electrons we are made of, and constitute more than 90 % of the mass density of the universe, is the dominating source of gravity. It collapses and assembles to form small, relaxed structures called « haloes », then still larger and larger haloes, in a process of hierarchical clustering. The small amount of normal matter that is present among dark matter can cool down and collapse in the potential wells of these haloes. Stars form from this cold gas and extract their energy from the nucleosynthesis of heavier nuclei such as carbon and oxygen. At the end of their lifetimes fixed by the amount of nuclear supply, they reject heavy elements into the interstellar medium. New stars and planets form in this gas once it is enriched in heavy elements. The third point is that, even if we think that the universe is infinite, the observable universe is finite, because of the finite duration of the expansion phase (15 billion years) and finite value of the speed of light. Our Galaxy is located at the center of a 15 billion light-year sphere that is the patch of the universe we can observe. What is beyond the surface of this horizon is not observable. We are not able to move instantaneously to remote space because of the finite value of the speed of light. The travel to distant galaxies is unfeasible. But, for exactly the same reason, we have access to the remote past of the distant regions of the universe, which gives us an image of our own past. So cosmological theories can be tested with observations. We are not at the center of the universe (which has no center), but we are at the center of our observable universe, exactly as any other galaxy is at the center of its observable universe. In some sense, we have recovered a position that was lost with the Copernican revolution. Modern cosmology also attempts to make a census of matter in the universe. But this census is far from completion. Young and old stars in galaxies are detected through deep optical fields till the edge of the observable universe. However, much of the content of the universe appears to be elusive : most of the young stars appear to be buried in dust shrouds and their energy heats up dust grains and is released at far-infrared wavelengths. There are dark baryons that emit little or no light in the halo of galaxies (brown dwarfs and/or white dwarfs). We also know that neutrinos are massive but there is only a lower limit on the mass. We still ignore the nature of dark matter that is detected through its gravitational effects in galaxies, groups, clusters and large-scale structures. And a cosmological constant with a repulsing effect in Friedman-Lemaître equations, that can be due non-zero vacuum energy, is now measured, without any clear interpretation. Finally, the description of the structures that appear in the universe requires an increasing level of sophistication from the large scales to the smaller ones : At the largest scales, only gravitation is at work. Galaxy formation involves not only gravitation, but thermodynamics, radiation transfer… The formation of stars is a very complicated issue. And the description of planet formation and evolution seems to be intractable. Here we reach the limits of the cosmological prospect.